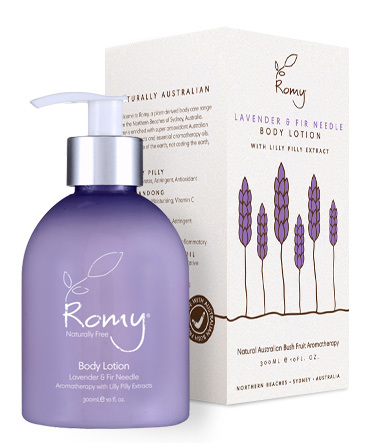 ROMY Lavender & Fir Needle Body Lotion restores and revitalises tired skin. Along with a host of other benefits, lavender is known to regenerate skins cells while nettle has natural anti-inflammatory properties. Lilly Pilly: Regenerates, Astringent, Antioxidant. Quandong: Nourishing, Moisturising, Vitamin C.
Macadamia Nut Oil:softening, moisturising, regenerative. Cocoa Butter: Healing, moisturising, smoothing. For best results, use after wash and apply to any part of the body. The preparation is intended for daily use.